Clean skin is an absolute for anti-aging. 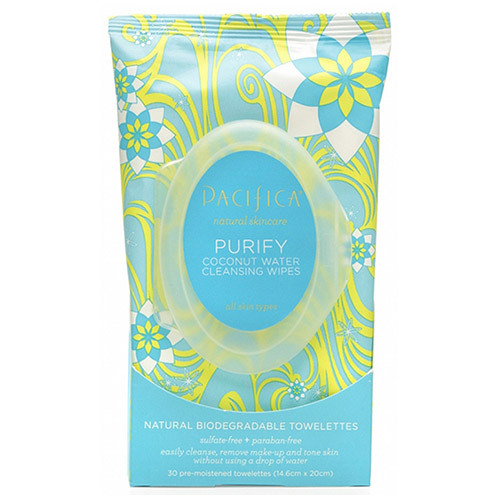 Coconut water infused natural towelettes gently cleanse your face while removing toxins, oil, pollutants and make-up from your skin without water. Papaya, a natural exfoliant, helps revive skin and remove dead cells. Aloe vera and calendula soothe and calm. These skin-loving wipes are an indispensable part of your daily routine for healthy skin. Anytime, anywhere. 30 pre-moistened biodegradable facial towelettes in a sealable bag. These wipes can remove most make-up, but due to the fact that we do not use chemical solvents, they will not remove the most water-proof make-up. They are a great follow-up to using a make-up remover as they will remove the residue from your skin leaving it refreshed. Purified Water, Decyl Glucoside, Glycerin (vegetable), Cocos Nucifera (Coconut) Water, Aloe Barbadensis (Aloe) Leaf Extract, Carica Papaya (Papaya) Fruit Extract, Calendula Officinalis (Calendula) Extract, Polysorbate 20, Citric Acid, Phenoxyethanol, Potassium Sorbate, Sodium Benzoate, Parfum (all natural). 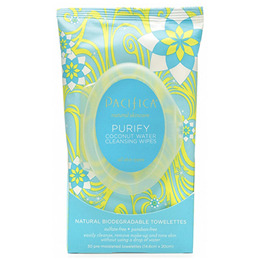 Below are reviews of Pacifica Coconut Water Cleansing Wipes - 30 Wipes by bodykind customers. If you have tried this product we'd love to hear what you think so please leave a review. Delighted with these. Natural... no nasty additives. Clean my whole body and face very well. Absolutely gorgeous smell but I didn't feel it left my face as clean as when I wash with water. When I used a toner afterwards there was still quite a bit of residual makeup, even though I don't wear that much. Pleasant smell, not bad for the price but really need a bit more moisture in them to do the job properly. I would buy them again but not for make up removal, just as a wipe. Love the fragrance, feel refreshed after use, perfect. Would love these in other fragrances.